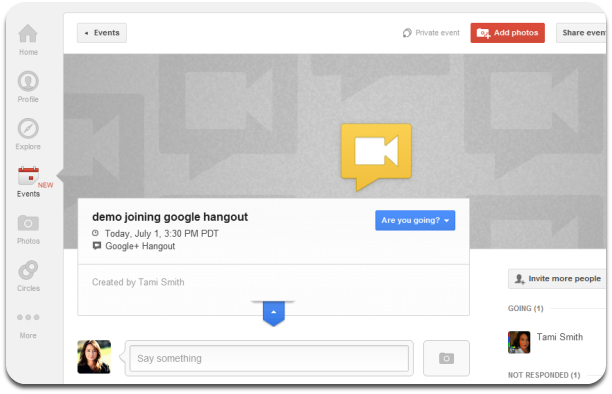 So you've been invited to a Google Hangout. You think you want to go but you've never done it before. Have no fear, I'll walk you through it step by step. Before you do anything else, take a moment now to complete step 1. Even if you think you might have this installed, do it again to receive the latest software version. Open it and then, click the red Are you going? button in the email. Click on the blue Are you going? button in the middle of the invitation and say "YES!" Just Click that button to join us! If you happen to be the 1st to arrive, come on in and I'll be there shortly! NOTE: Don't worry, you'll have an opportunity to set up your microphone and webcam before you go live! So, if it is a private Hangout it will look like this! That's it ~ Looking forward to connecting with you on Fridays! Join the Weekly Google+ Hangout for Entrepreneurs. New to Google + ?